For my final knot design this year, I thought I would tie a lanyard for my rear view mirror in hope that it will bring me good fortune next year. 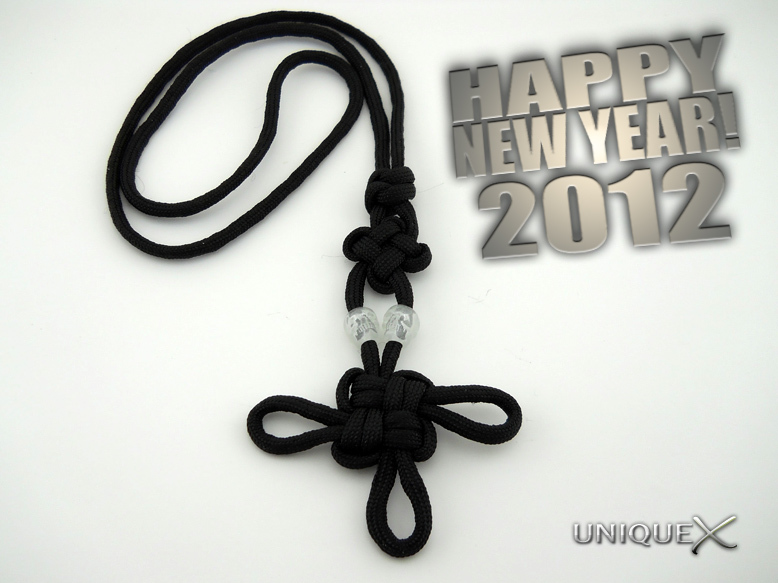 The lanyard is tied with three Chinese knots, the Good Luck Knot, Butterfly Knot, and the Snake Knot. The Good Luck Knot is used on monk's garments or drapes in temples signifying good luck. The snake is one of the twelve animals in the Chinese horoscope. It is regarded as bringer of good fortune, and also the guardian of treasure. 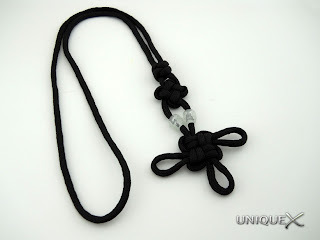 If you subscribe to the notion that "it can't hurt", then continue reading to view links to the tutorials and books that I used to tie this lanyard. I tied this lanyard using eight feet of black 550 paracord, I added two glow in the dark skull beads that don't add any luck value to the lanyard but look cool glowing in my Jeep at night. I started by tying the Good Luck Knot. I learned to tie this knot from the Complete Book of Decorative Knots by Geoffrey Budworth, but if you don't own the book, you can find other alternative tutorials at the end of this post. Then I tied the Chinese Butterfly Knot, I learned this knot from The Book of Decorative Knots by Peter Owen, although I couldn't find any alternative tutorials for this knot, you can search the book in Google Books for "Chinese Butterfly Knot" and you can view the tutorial. The last knot I tied on the lanyard was a Chinese Snake Knot, I don't remember which tutorial I used to learn to the design because there are so many available on the internet, you can use one of the links listed at the end of this post to tie the knot. If you intend to make a closed loop on your lanyard, you can use the same method that I used. Insert one end of the cord into the other end of the cord and sing them together. Then start loosening one of the cords of the Snake Knot and continue loosening to the Good Luck Knot and eventually you will end up with one single cord and the joined together section will be hidden inside the Snake Knot. Even if you don't tie this design, I hope you have good luck and fortune in the coming year. Thank you for supporting my blog, Happy New Year! Enjoy this post? Stay current and subscribe to our RSS feed. Check out the 2012 chinese horoscope. do u remember where u got the cord from? 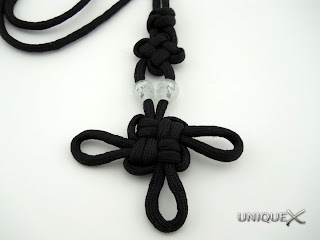 @Anonymous: I ordered the black paracord in bulk from Camping Survival. If you have any questions or comments, please feel free to comment. I can usually reply to comments within a short period of time, in the mean time you might try searching Google and entering your question there, this usually works for me. Thank you for reading and don't forget to subscribe for updates by clicking the links in the menu in the upper-right corner, or you may Subscribe to Unique Ropecraft by Email. Note:Your comment will not appear directly after submitting, comments require authorization prior to publishing. If you found this blog helpful then please show your support by clicking on the advertsing links located throughout this blog (between posts and on the right column). All data and information provided on this blog is for informational purposes only. The creator of this blog (Chad Poole a.k.a. SyberProdigy) makes no representations as to accuracy, completeness, currentness, suitability, or validity of any information on this site and will not be liable for any errors, omissions, or delays in this information or any losses, injuries, or damages arising from its display or use. All information is provided on an as-is basis. By using this blog you agree to the exclusions and limitations of liability stated here and accept them as reasonable. Do not use this blog if you do not agree that they are reasonable. Material on this blog, including text and images, are protected by copyright law and are copyright of the creator of this blog unless credited otherwise. All intellectual property rights in relation to this blog are reserved and owned by the creator of this blog. Links to other websites are provided for the convenience of users. The creator of this blog is unable to provide any warranty regarding the accuracy or completeness of the content of such sites, or the reliability, quality or effectiveness of any products provided through external blogs. A link to an external site does not imply an endorsement of the views, information or products provided or held by such sites. The creator of this site reserves the right to revise and amend this disclaimer notice from time to time and any revised version will be deemed to be applicable from the first date of publication on this blog.